Iraqi army tanks and armored vehicles on Wednesday fought off an advance by Islamic State militants on the town of Amiriya Fallujah, west of the Iraqi capital Baghdad, army sources said, part of a multinational effort to check the group’s progress. The sources added that around 400 fighters amassed in the nearby towns of Fallujah and Karma the day before, piling pressure on the capital’s western flank. Government forces fought back Islamic State outside Amiriya Fallujah — which faced a siege by the militants for much of this month and is the last government-controlled town before the key provincial city of Fallujah. Soldiers destroyed five of the fighters’ vehicles, a security source said. There were no immediate reports on the number of casualties from the fighting there, but the militant advance appears to have been halted. 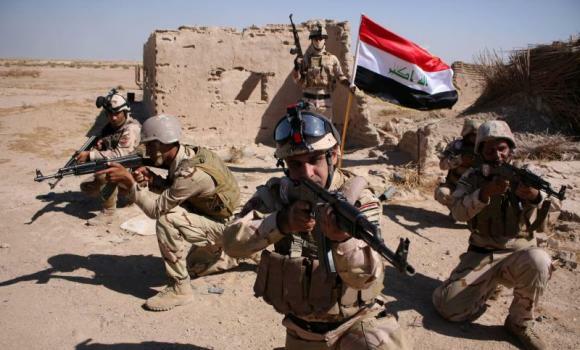 Another battle between the two sides raged in the area around Hit town, also in western Anbar province, but the outcome remained unclear. Hit is a walled market town located some 130 km (80 miles) west of the Iraqi capital Baghdad seized by Islamic State militants at the beginning of October. Anbar’s largest airbase Ain Al-Asad, the Haditha Dam — a critical piece of infrastructure — and surrounding towns are encircled by Islamic State to the west from the Syrian border and to the east from militant-controlled sections of Ramadi. The province fell into the militants’ hands after years of tension between the Shiite Muslim-led government and the Sunni majority population, which seeks greater autonomy. Retaking the lost towns and encouraging Anbar’s Sunni tribes to take up the fight against Islamic State will be vital to reviving the shattered Iraqi state’s control over its territory. The tribespeople did not take part in the fighting near Amiriya Fallujah. The United States and other Western countries have repeatedly bombed the Sunni jihadist group’s positions in Iraq — including in the Fallujah area on Wednesday — and Gulf countries have also taken part in air strikes against it in Syria which began last month. Declaring a caliphate, or Muslim theocracy, Islamic State took advantage of sectarian warfare and weak state control to grab swathes of Syria and Iraq earlier this year. Islamic State fighters have also laid siege for a month to Kobani, hundreds of kilometers to the northwest on the Turkish-Syrian frontier, and only intense bombardments by US-led coalition warplanes have halted their advance.